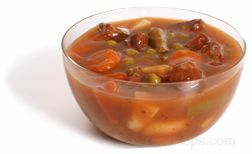 A mixture of meat, poultry, or fish chunks, vegetables, herbs, spices, and liquid, such as water or stock, which are cooked together slowly at a low temperature in a covered pot. The liquid usually becomes thickened as the ingredients are slowly cooked. Stew is often served as a hearty main dish.